Wanna save a little money? 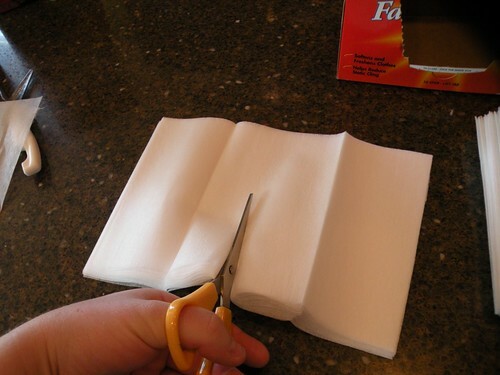 Cut your dryer sheets in half. They work just as well as the full sheet. Swear. 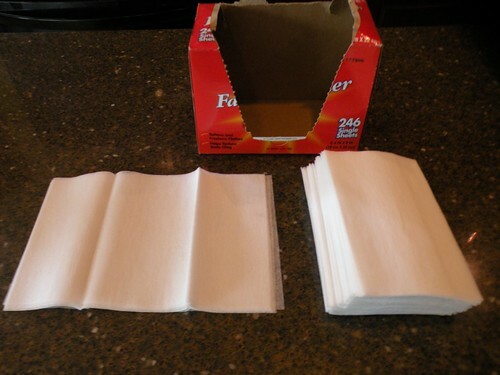 Just take your dryer sheets and unfold them all. This goes quickly believe it or not. Now just cut them all in half. And then stuff them back in the box. Oh sure you could probably put them into a nice fancy container. But I didn’t have one, so the box it is! It’d be even cheaper to just stop using the sheets all together, but I like ’em and don’t want to stop using them! I used to do this too! Until I discovered… The dryer BAR! By bounce! (no i swear I don’t get paid by them just a huge fan) a ex boyfriend of mine (yes he actually did laundry to make it smell good ) had one and he showed me how nifty it was and how I did not have to remember to put a sheet in every time and I fell in love! I have one now and it is amazing! I get the 4 month one in fresh linen. I do this too! Except, I don’t unfold them. I just grab a handful and cut in 1/2 the other way. Now I skip the dryer sheets and toss a couple of clean tennis balls in my dryer. No nice smell but no static clinc! And the tennis balls were freebies so I have more money to spend on DIY stuff! I don’t know why I never thought of this before?! I do use the same one a few times, though. Good idea! Just have to remember to wash out your dryer lint catcher with SOAP and water every month or so. Dryer sheets leave a film on the lint trap that will build up, not allowing proper air flow and will lead to a fire. (To see if yours it built up, just run it under water. It looks clean, but the water doesn’t run through.) I switched to liquid years ago when my dryer repair man told me that. Food for thought! What a great idea!!! I am going to try Megan’s idea and see if I like the “BAR”. Sounds like a good alternative. PS Cutting the dryer sheets from now on!! As I have a couple boxes of them!! Ohhh, thanks for the easy tip! I’ll totally have to try this.. and apparently I need to wash my filter, too. Yikes! Great tip! The hubs uses dryer sheets, and this would save a good bit! I have been doing this for yrs. Only I just take them one at a time & rip it in half. They actually rip easily & usually right in half. 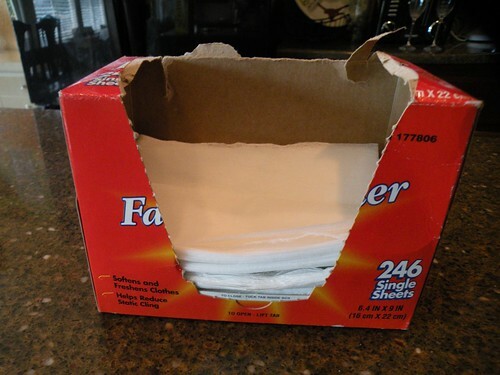 I use dryer sheets for more than one load…saves money. So, if I cut them in half, I would get that many more loads done for less money. Years ago, I cut 4″x6″ sections from an old holey white t-shirt. I soaked these in liquid fabric softener, squeezed out the excess, and hung them up to dry. I toss one in each dryer load. You can use the same one over and over again for months. I have only had to soak them again once or twice. SUPER CHEAP! I actually save money by not using Bounce at all. I stopped using it 14 yrs. ago when I brought my first baby home from the hospital and I read about all the toxic chemicals used in Bounce. Static Electricity on clothing is actually caused by the clothes being over dry…or in the dryer for too long. If you have a new dryer with a sensor that stops drying the clothes when it senses the clothes are dry, you can avoid the static. This is such an interesting post with great comments. I just started using white vinegar in my wash with the detergent (use it in place of fabric softener). It gets out the yucky smells that sometimes get into laundry like really stinky rags or wet laundry that sits too long. Anyone else tried this? Vinegar works wonderfully! I use it in every load for 2 reasons: fabric softener and cleaner. I have a front loading washer and used to have a problem with odor. The washing machine cleaners worked well but were way too expensive. Then I heard about using vinegar to clean it. It has been over 3 years now and I use the cheapest vinegar I can find in EVERY load. 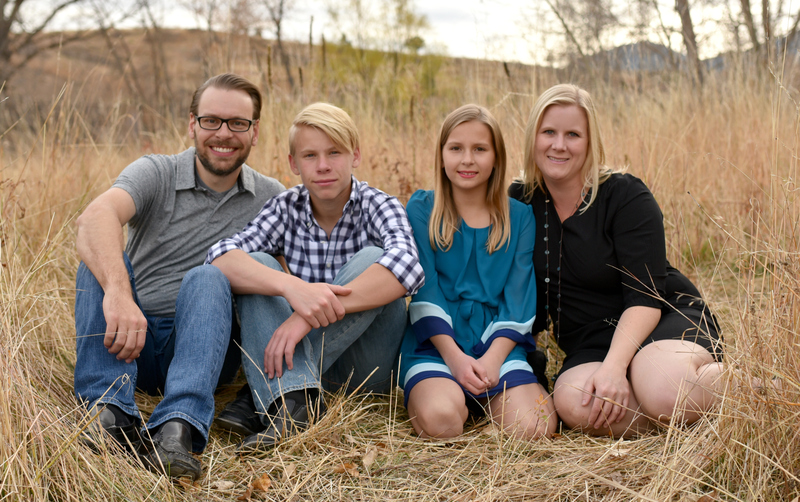 No odor, soft clothes and no static cling.